To me, nothing is scarier than an evil child. These kids are pure evil wrapped in the guise of innocence. They can usually get away with whatever they want and no one suspects their cute little angel of being a monster. Even if they are caught, what can anyone really do about it anyway? 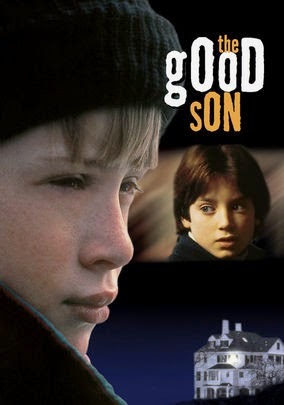 If that's not frighten enough, think about the fact that every serial killer on earth was at one time a child, and films like The Good Son represent a story that could be happening right now. The film begins when young Mark (Elijah Wood) losses his mother in a traffic accident. Mark's father is so distraught that he needs some time to himself and sends his son to live with his brother's family in the country. Both families think it will be good for Mark to be around someone his own age, his cousin Henry (Macaulay Culkin), but what they didn't know is that Henry is pure evil and has killed before. We see stories like this from time to time, but never one that is so realistic. When you think Killer Kids, movies like The Omen come to mind, but this is different as Henry isn't possessed, he's just a psychopath. This was Macaulay Culkin's first role after Home Alone and he is beyond terrific. At his age, Culkin is asked to play two roles, the innocent kid with the face of an angel and the demented psycho with the heart of the devil. How a pre-teen, who'd only been in two films prior, could accomplish such a feat, is nothing short of astounding. Elijah Wood is also great, showing that some people are just naturally talented. I've seen Wood in dozen's of things since The Good Son and his eyes still creep me out, it's almost like he can see right through you, and that might have made him a better choice to play Henry. While Wood might have had the look, you'd be hard pressed to find any kid who could do a better job than Culkin did here. The Good Son is mysterious, creepy, and a whole lot of fun to watch. It's among my favorite Horror films and really is one of the most underrated films of the nineties.